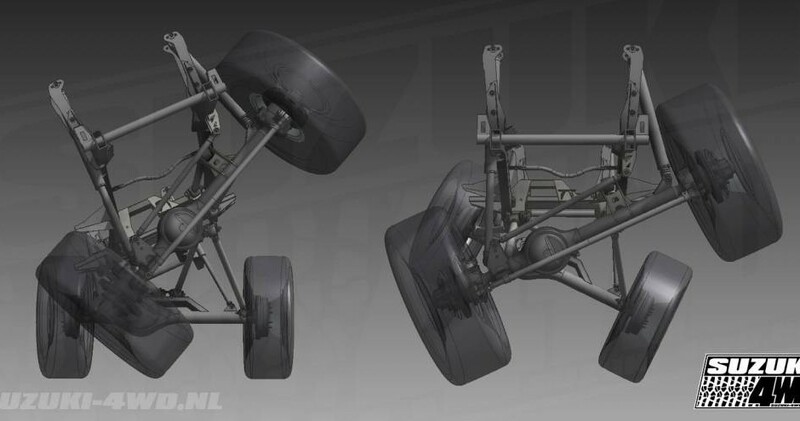 The drawing of every suspension part and the chassis is ready. Now it's time to make the actual design with the 4-link and 3-link + Pan-Hard bar. After looking on the internet for some inspiration, I found the Pirate 4×4 forum and i found several build topics about link suspension on Zuk's but not one topic about a LWB Zuk so i couldn't do a 1:1 copy. But since everyting is now available in CAD we could play around with all the options and use the Link calculators to get a decent design. So i started a "Thread" on the Pirate 4×4 forum with some designs and let people give there opinion. There was ony member that was very helpfull and his nicname is "am4x4" and he own's a company called "Mayhem Metal Works". we tryed several link positions on the frame and axles as you can read in the "Thread" on the forum. I will show some pictures of the final CAD design below and then we will start building.